Launched in 2007, the Procurement Planning and Monitoring Report (PPMR) was created by JSI's USAID | DELIVER PROJECT to capture information on contraceptive stock and shipment statuses, and other contraceptive security issues, from family planning programs on a country-by-country basis. 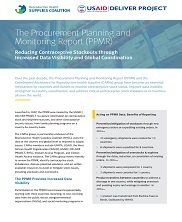 Reporting data regularly via the PPMR gives countries the unique opportunity to communicate updated data and supply needs to both in-country and global-level stakeholders, particularly to donors of reproductive health commodities. This direct line of communication enables donors to improve coordination within their own agencies, between agencies, and with family planning programs in order to ensure that countries’ needs are being addressed effectively. JSI / USAID | DELIVER PROJECT, 2016.